“Four years ago, in a small warehouse in central China, a team of Chinese archaeologists showed me objects that they had unearthed from a nearby ancient tomb. Laid out on a folding table was an exquisite array of vases, ritual vessels and a set of heart-stoppingly beautiful silver gilt tigers and dragons that fit in the palm of my hand, perhaps part of a long-forgotten regal board game. This week, curators and conservators from the Metropolitan Museum of Art (Met) are in Beijing working with Chinese colleagues to pack these and other objects for transportation to New York, where they will be featured in an exhibition this spring. Supported in part by the National Endowment for the Arts (N.E.A. 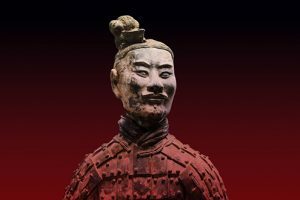 ), the exhibition, “Age of Empires,” will teach our visitors about the origins of China, the superpower that is now playing a major role in the balance of world power and trade. All too often, art is seen as a “soft” subject, the first thing to be cut, whether by local school boards or the federal government, when money is tight. But looked at purely in dollars, it is a false saving. The N.E.A.’s budget is comparatively minuscule -$148 million last year, or 0.004 percent of annual federal discretionary expenditures- while the arts sector it supports employs millions of Americans and generates billions each year in revenue and tax dollars. The United States has no ministry of culture. In this vacuum, the N.E.A., founded in 1965, serves three critical functions: It promotes the arts; it distributes and stimulates funding; and it administers a program that minimizes the costs of insuring arts exhibitions through indemnity agreements backed by the government. This last, perhaps least-known responsibility is crucial. This fall, the Met will host a major exhibition on Michelangelo that will bring together masterpieces from across the world. The insurance valuation is a whopping $2.4 billion — not even our museum, the largest art museum in the nation, could come close to paying the premium for such coverage without the federal indemnity the N.E.A. makes possible. I fear that this current call to abolish the N.E.A. is the beginning of a new assault on artistic activity. Arts and cultural programming challenges, provokes and entertains; it enhances our lives. Eliminating the N.E.A. would in essence eliminate investment by the American government in the curiosity and intelligence of its citizens. As the planet becomes at once smaller and more complex, the public needs a vital arts scene, one that will inspire us to understand who we are and how we got here — and one that will help us to see other countries, like China, not as enemies in a mercenary trade war but as partners in a complicated world.